SAP vs Oracle: Which of These ERP Software Leaders Wins in 2019? With all the research you’ve done so far, your motivation to find the perfect ERP might be waning. But, wait! You’re so close! As the top two solutions on our Enterprise Resource Planning (ERP) Leaderboard, it’s likely that many of you have already narrowed down your choices to these two products. But when deciding which ERP software to invest in for your entire business, confidence is key. Are you fully aware of the difference between SAP and Oracle? Edit your expense report with Oracle’s Expense Entry application. Review and submit reports, as well. Both SAP ERP system and Oracle ERP system have amazing financial management capabilities. Features like accounts payable, accounts receivable and fixed asset management all tie with a perfect score. However, Oracle’s software manages to win in this category for a few reasons. This vendor scores slightly better in risk management than SAP. Oracle provides improved financial management and reporting reliability and ties in GRC requirements. Oracle prides itself on risk management solutions that help to enforce enterprise-wide compliance and automate some forms of compliance in various industries. These tools help to prevent things like cash leakage and bring a level of policy enforcement that helps companies feel confident about the risks that they face. But SAP’s risk management tools are still good and can help your business identify and better understand risk factors. Oracle ERP modules provide tools based on common processes. There’s ‘Asset Management to Retirement,’ covering the full lifecycle of assets, from acquisition to amortization and eventual disposal. There’s also ‘Transaction to Cash Position,’ again, taking a point-of-sale approach and integrating it with long-term financial data. Oracle’s ERP system scores significantly higher in budgeting. SAP’s software has relatively basic budgeting – containing the abilities to manage and execute general planning. Oracle, on the other hand, boasts a specialized tool called ‘Asset Lifecycle Management’. It enables you to fully realize the financial potential of your equipment and other facilities. You also get a series of features that handle the typical budgeting needs of any business. Oracle outscores SAP’s basic features here as well. SAP will do the job, but Oracle’s advanced pricing tools could make all the difference for your company. Oracle can change your base prices to match market segment, currency, exchange rate and more. It can also manage profit margins, rebates and discounts using set guidelines. 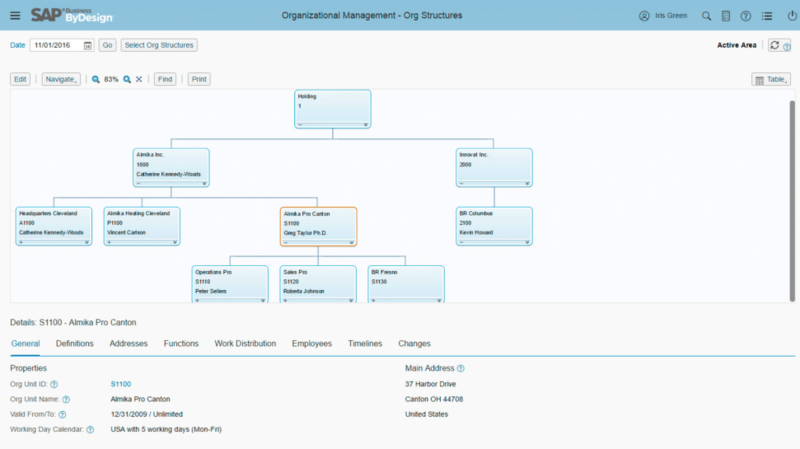 This is an example of the organizational structures available within SAP’s HR module. Oracle is a good choice for your HR management, but SAP goes the extra mile here. SAP manages a plethora of HR functions and allows users to access critical information on them all in one place. Employees also enjoy a designated portal, so they can update their own information as needed. SAP ERP software also helps with things like payroll and offers e-recruiting functionality to help companies know how they’re dealing with employee retention and battling turnover. While maybe not as robust overall, Oracle does have great reporting capabilities with visual representations allowing for quick communication. This could be especially important to your company if you are looking to make more of your HR decisions based on data. Easy-to-visualize data can help you grasp overall trends, allowing you to quickly see your company’s history and projected future. Both Oracle and SAP have good CRM software but the systems have strengths and weaknesses in different areas. Oracle does well across the board but isn’t excellent at any one thing. SAP has some really outstanding features, but also some that are simply satisfactory. For instance, Oracle has good marketing support which provides the ability to manage campaigns on a single platform. SAP does only okay here, providing cross-functional processes relating to finance, procurement and marketing. You can plan campaigns and budgets, but it’s still not as good as Oracle’s setup. Oracle’s ERP also has good Customer Account Management, but SAP excels in this field. SAP has you covered on all fronts involving the customer. With this solution you can see your customers’ histories, allowing you to tackle lead generation more effectively. It’s also integrated with marketing, sales and finance, giving you the whole story on your customers. The more you know about your customers, the easier it is to market in-context and use smarter selling strategies. Both solutions’ sales-order management gets a good rating from us. SAP casts a wide net and meets the needs of distributors of all sizes, in all industry segments and in all sales channels. Oracle’s strengths lie in their reporting and data capabilities. While a good CRM is important to keeping happy customers, so is an efficient supply chain. We see that both ERPs have comparable SCM software, but again, they are strong in different areas. Although the applications technically score the same, you’ll want to make sure that the features of the ERP you choose align with the needs of your business. Distribution Management, which provides information on warehouse profitability and manages other distribution tasks, is good in both ERP systems. The Purchase Order Processing feature of each solution is also equally capable. SAP utilizes their ‘procure to pay’ module to help companies manage purchases and enforce vendor choices while looking at their procurement patterns to drive future decisions. ‘Order to cash’ helps to manage quotes and other aspects of contracts with vendors, as well as looking at deliveries. Oracle contains a ‘Supplier Invoice to Payment’ process management tool for vendor relationships. This includes things like supplier registration, contract creation and invoice payment tools to help make it easier for a company to purchase what it needs to function. Oracle’s ‘time and labor cloud’ and ‘sourcing cloud’ tools provide transparency for these sorts of tracking. The applications start to vary in caliber with Event Management and Advanced Planning System (APS). SAP has better event management, giving you greater insight and visibility into your supply chain. But Oracle has better APS, allowing you to better track costs and allocate resources more efficiently. Related to SCM, inventory management is a crucial part of maintaining a strong warehouse and overall supply chain. And while both ERP solutions offer extremely robust inventory management, they’re different enough to merit a header. What makes many of today’s inventory management so useful is cloud deployment. Cloud-based ERPs allow for real-time visibility of all data across the business. 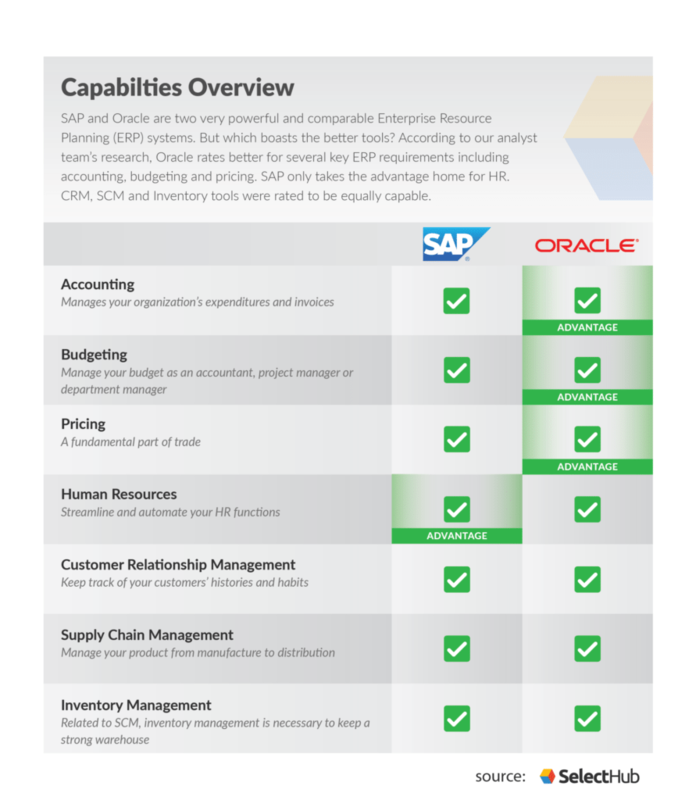 For both Oracle’s and SAP’s inventory management, this means more up-to-date stock levels and better understanding of how your products move. All this feeds into a more efficient supply chain which ultimately means happier customers. SAP stresses that their Inventory Management helps prevent stock shortages, while Oracle emphasizes boosted productivity. And while both SAP and Oracle offer cloud deployment, only the latter offers an on-premise solution. So even though the U.S. government has put their faith in the cloud, many industries still won’t use cloud-based products for compliance reasons. This obviously becomes a major factor when choosing a software. Comprehensive ERP tools help businesses to cut through the ambiguity and drive better decision-making through a clear look at actual finances and operations. And overall, both SAP and Oracle ERP software do this well. On our Leaderboard, the systems’ ratings only differ by three points with Oracle receiving 90/100 and SAP scoring 87/100. When comparing Oracle vs SAP the main differences are seen in the systems’ financial management modules. Oracle simply has a more comprehensive financial suite, with better budgeting, pricing and core accounting tools. All other features were rated equally by our analyst team (except for HR, which SAP did win the advantage for). But since Oracle puts in the extra effort where companies often need it the most, this vendor is the winner between the two. Do you agree or disagree with our analysis of the two vendors? Which do you prefer or use at your company? Leave us a message down below! oracle and sap are the two top level erp solutions available in the market.So according to our need we can opt any one as needed considering all the points stated above. I will say it openly – Oracle ERP GUI is the worst UI I’ve ever seen. Part of it is Java applet (!) looking and working like early 90’s, part of it is web UI (the most usable one), part of it is Excel (!). The concept of responsibilities and modules is so badly designed that you inevitably end up with endless opening and closing your project in various modules because even can’t have open multiple modules one time (and I bet you won’t be able to do it without notepad & clipboard)! It’s as you would have house with doors only outside, so moving to another room requires you to go outside the house and walk around to find your room (which you are never sure it’s the right one). Yes, technically they have the features they are boasting about, but almost all of them are so crappy and user-unfriendly implemented that (unless you got asleep in front of your PC in 1989 and now woke up) you will get mad every second you open it. Obviously the best on Oracle is their sales people. This article seems not to reflect real world experience. SAP is superior in many areas compared to Oracle, especially financials, supply chain, and inventory. I have worked with both and know how well both work in various areas. If it was my money, I’d buy SAP. Hi VJatec! Thank you for sharing your perspective and helping readers determine which system might be best for their company. While we stand by our analyst team’s findings, we always stress that one particular system will not benefit each business the same. Like you said, SAP may be the better choice for many businesses, depending on their specific needs and operations. Thanks so much for reading! You can contact our team at 877.692.2896 to get specific recommendations based on your company’s unique needs!